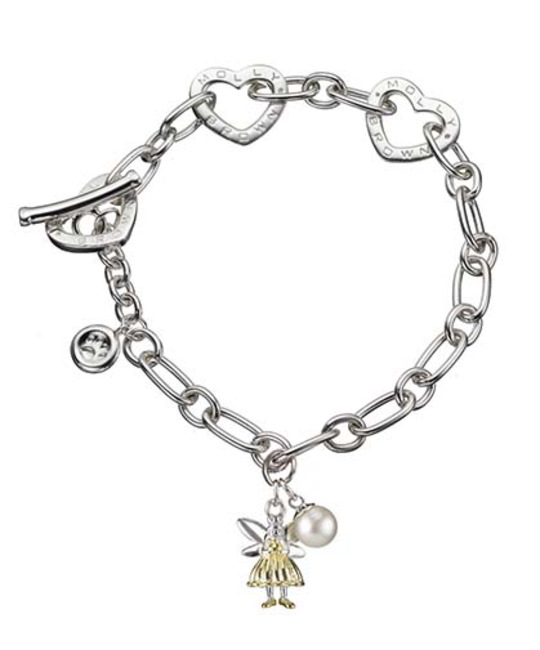 A sterling silver charm bracelet with a beautiful gold vermeil fairy, with 9ct gold vermeil slippers and a fresh water pearl depicting the precious gift Merrigold the fairy brings: The Gift of Love. The oval and round link charm bracelet has heart shaped links at 13cms, 15cms and 17cms making it adjustable to fit most wrist sizes, with the delicate fairy charm measuring 11mm in width, 9mm in depth and a total drop of 14mm. SILVER CARE: Polish with soft cleaning cloth. Best stored in a plastic sealed bag, to avoid exposure to oxygen and moisture. PEARL CARE: Pearls can be cleaned using a soft lint-free cloth, dampened with water, allow pearls to air-dry before putting away. Store in jewelry pouch provided with purchase.